In the last few months, Primeros Pasos has been busy with community outreach and medical activities, communications projects, and fundraising. Read on to find out more about the work of Primeros Pasos in the last quarter of 2018! We were thrilled to organize a presentation for Roger Thurow and his book The First 1,000 Days: A Crucial Moment for Mothers and Children, and the World. An internationally renowned author and finalist for the Pulitzer Prize, Thurow has been on the Chicago Council on Global Affairs since January 2010 as senior fellow on global food and agriculture and previously wrote for the Wall Street Journal for thirty years. In collaboration with Primeros Pasos, Thurow wrote a journalistic narrative on malnutrition in four corners of the world: Guatemala, Chicago, India, and Africa. He returned to the Palajunoj Valley this December to present the new Spanish version of the book to the mothers that he had worked with and to follow-up on his research of child and maternal health in the Valley. We had a great audience at the presentation, including many local medical professionals and nutritionists who have been working to solve the issue of malnutrition across the country. It was a pleasure to welcome Thurow back to Guatemala and Primeros Pasos and we look forward to collaborating with him more in the future! 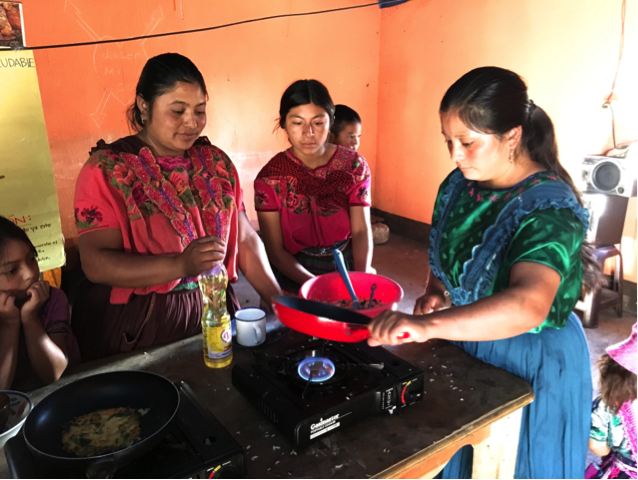 We celebrated the end of the Open Nutrition Group for the year with interactive Healthy Cooking Workshops in each of the four communities—Bella Vista, Las Majadas, Tierra Colorada Baja, and Candelaria. These workshops are intended to inspire the mothers to cook healthy meals for themselves and their children with easily accessible ingredients as well as reinforce community bonding. The mothers were excited to show off their cooking skills, making delicious Tortas de Arroz y Chipilín (Rice and Chipilín Pancakes) and Atol de Arroz y Maní (Rice and Peanut Drink)! We used fresh carrots, greens, milk, eggs and other ingredients to create an easy, nutritious meal that the whole family can enjoy. We are excited to bring more frequent cooking workshops to the communities in the coming year! This quarter, we were kindly assisted in developing our communications strategy by students at Mesoamericana, a leading university located in Xela. Throughout four months, the student team at Mesoamericana took over our publicity and created three promotional videos. The videos were intended to enhance the online presence of Primeros Pasos. Content includes interviews with staff members and patients, beautiful shots of the Valley and a look into the daily operations of the clinics. The videos contain subtitles, therefore accessible to the wider audience of Primeros Pasos, and are around five minutes long with excellent detail. We had the pleasure of going to the graduation in the impressive Mesoamericana building to give our thanks to the students. We wish them the best of luck with the rest of their careers; we are sure they will be prosperous and successful! 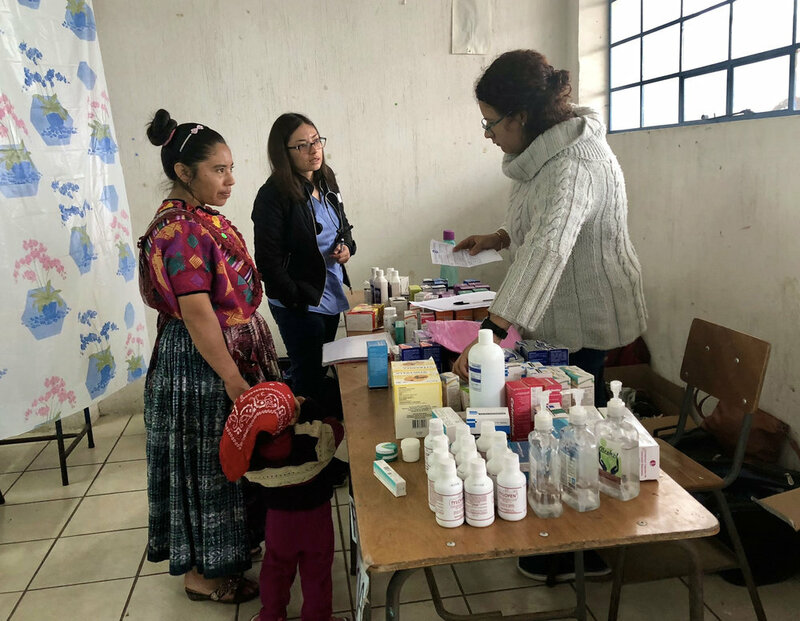 Building on our successful first round of mobile clinics, the Primeros Pasos team went back out into four target communities to deliver high quality healthcare. Spending a day in each community, our medical team mobilized all our services and went directly to the communities. Our focus this time was on the health needs of adults. We are delighted to share that we saw 90 patients. Harnessing the skills of our staff, volunteers, and doctors, we were attentive to all medical needs and ensured that community members were served. Mobile clinics are an effective method to reaching those who need medical care but face obstacles to seeing a medical professional due to geographical issues. Community members were extremely grateful for all our work. We want to thank our donors for making two rounds of mobile clinics possible this year and ensuring that medical care can be bought to those most in need. Mobile clinics play a vital role in our work and we hope to have many more next year! At the end of November, we launched our Health for the Holidays campaign —a movement to increase funding and bring affordable, quality healthcare and health education to the Palajunoj Valley in 2019! Throughout December, we will be publicizing snapshots of life in the Palajunoj Valley, reflections from community members on the work of Primeros Pasos, and their hopes for the new year. We encourage anyone willing to donate to support a fundraising team or to set up their own fundraiser through the online fundraising platform Classy or Facebook. Create your own profile on our own donation platform on Classy and/or create a Facebook fundraising page --> click Raise Money button --> select Non Profit --> search & select Inter-American Health Alliance --> set a goal and personalize your story then send the link to all of your email contacts as well as post it on your Facebook pages. You can also support the work of Primeros Pasos through Amazon Smile! Everyone loves to party and the Primeros Pasos team is no different! This quarter was particularly exciting in terms of fundraising and we provided the people of Xela the perfect opportunity to get into the festive mood. 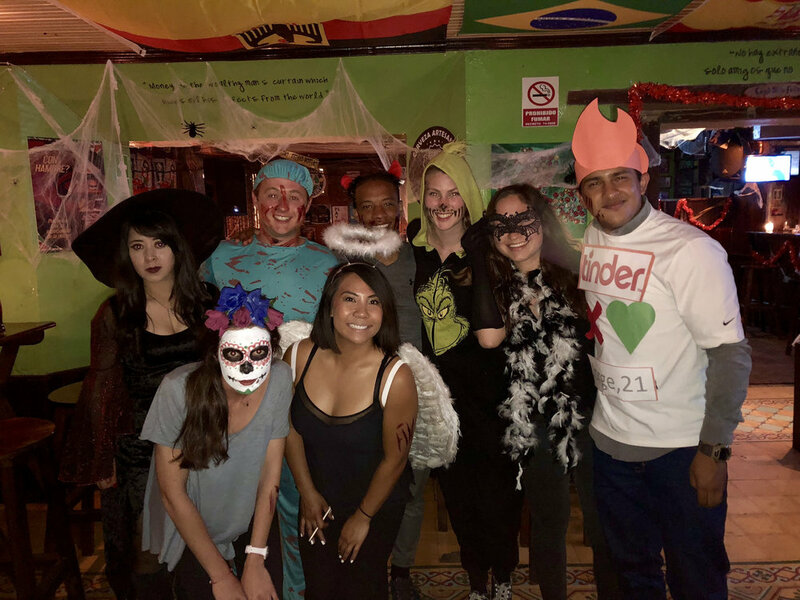 We planned, coordinated and led a Halloween party at El Shamrock and a Thanksgiving dinner at Kasa Kiwi. Through careful planning and promotion, the events were a resounding success; both events were well-attending and lots of fun! We used the events and social media publicity to spread awareness of the work and mission of Primeros Pasos. They were also a great way for our foreign friends to keep up with traditions while away from home. Dressing up in scary costumes and eating ample food are the highlights of October and November and life in Xela is no different! We want to thank the wonderful staff at El Shamrock and Kasa Kiwi for their assistance and drive in making the events a success!